Keep it clean and simple. An uncluttered layout is easier on the eye than a crowded composition, making it easier to read. Give words and images room (white space) to breathe. 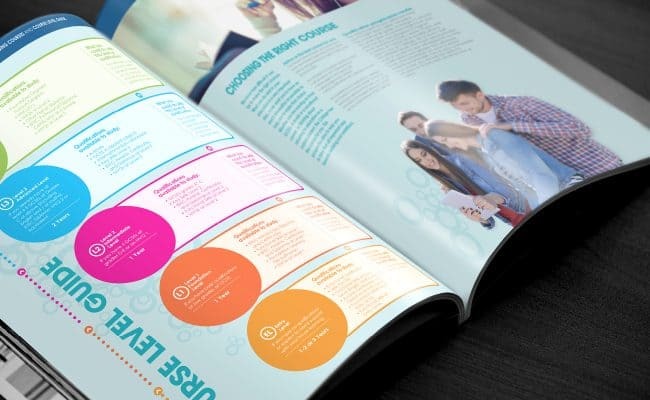 Get off to a strong start with a clear and concise contents page so readers can easily navigate the entire prospectus. Don’t be afraid to introduce different colours, icons and/or tabs to make each section stand out. Choose your fonts wisely. Big, bold typefaces are easier to read than lighter, smaller, more decorative fonts. Bear in mind that certain fonts set at 12pt, for example, can appear bigger or smaller depending on the specific font. Opposites attract. Aim for a good contrast between background and font colour to make words stand out and easier to read. 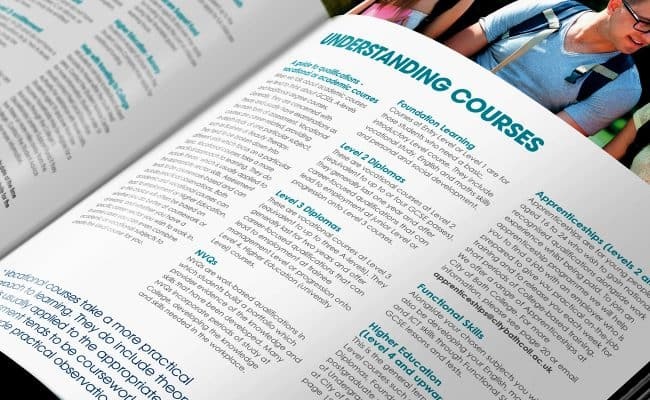 Break down courses into clear and concise sections with a short, snappy intro. Include course name; grade requirements; course level/award; and career opportunities. Integrate profiles between the course descriptions: meet a staff member; student studying relevant course; former student’s employment success. How to apply should be clear and obvious. Show links to social media channels. Shine the spotlight on Contact Us. Clearly direct people to email, phone, and website for enrolment details, more information and enquiries. Give them a reason to keep on reading. Great content should speak directly to the reader and grab their attention. Use the word “you” to make a personal connection. Stick to plain English and sound genuine. Sentences should be straightforward and engaging. Set the tone and be consistent. Aim to sound welcoming but not too informal. Make it conversational, never complicated. End with a clear call to action. Your audience is not just students but also parents and carers. Appeal to schools, including local schools who may have a preference for local colleges. Use bullet points to highlight important information. Include bite-size details that are easy to remember. Include quotes from students to add credibility and bring content alive. Don’t overwhelm with information overload. Be relevant and on point. Keep it real. Use vibrant and diverse images that represent people learning within a thriving college environment. Photographs of students in a natural, relaxed setting will appeal to prospective students and reassure parents. 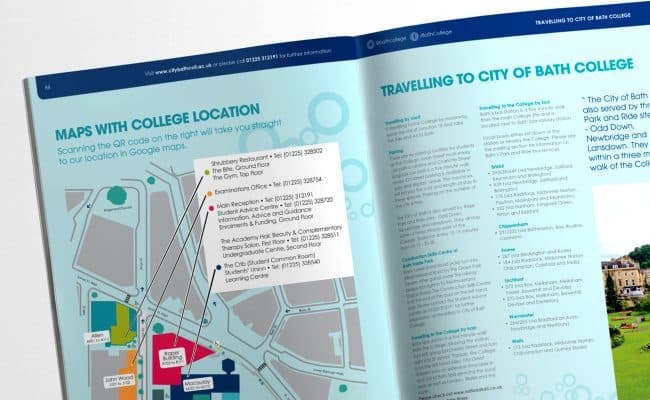 Showcase the college’s facilities, classrooms and accommodation to familiarise people with the place. Consider full-page photography for maximum impact. Larger images help to break up areas of written content, especially course sections, and help to sell the overall college lifestyle and experience. Photographs get the message across when attention spans are short. Our brains process visual information much quicker than words. Be proud of achievements. Let people know about any college success. Shout out about awards, accreditations, partnerships and impressive pass rates. Mention successful alumni and post-graduate achievements. This information helps to build a solid, credible reputation. Focus on USPs, such as cinema; virtual reality (VR) labs; 3G football pitches. Think practical. Mention training kitchens; beauty salons; IT suites. Share success stories of former students. Include staff/teacher Q&A sessions to inspire potential students and families. Show off the college’s fun side. Remind people that higher education is not just about course work, tutorials, revision, and exams. Outside the classroom, there are great opportunities to meet new people, discover fun activities, and learn new skills. These opportunities also help to reduce stress, boost confidence, and increase a sense of belonging among students. Let people know there is something for everyone. Give information on clubs (chess, dance, theatre, cooking, sports). Talk about events and fundraisers that bring people together and raise funds and awareness for different charities. Discuss volunteering opportunities and helping with local organisations. Look organised. Forward-planning and calling attention to key dates are signs of good management. Planning is a fundamental part of modern life, especially when people are busier than ever. Promote relevant dates throughout the year to keep people informed and up to date. As well as the obvious (term dates, etc. ), include dates of fairs and mention charity events to give a sense of community spirit. Additionally, dates of workshops and speakers will inspire and motivate students. Term dates for the academic year. Be helpful and informative. Include location map, address (including postcode) and directions. Outline different modes of public transport, journey routes, distance, and online links to planning a journey. Look responsible by encouraging sustainable travel options that reduce carbon emissions. Advise on student travel discounts including eligibility for free travel. Give money-saving tips, where possible, on travel. Give details on far it is to walk from bus/train station to college. Include bike hire details if any. Suggest car clubs or park and ride schemes. Never assume, explain the process. Break it down into simple step-by-step stages, or add diagrams to visually describe the steps in the process. 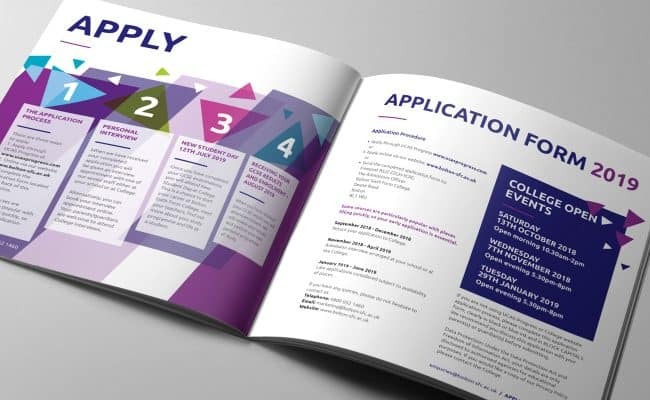 Consider adding a summary of ‘what happens next’ once the application has been submitted. 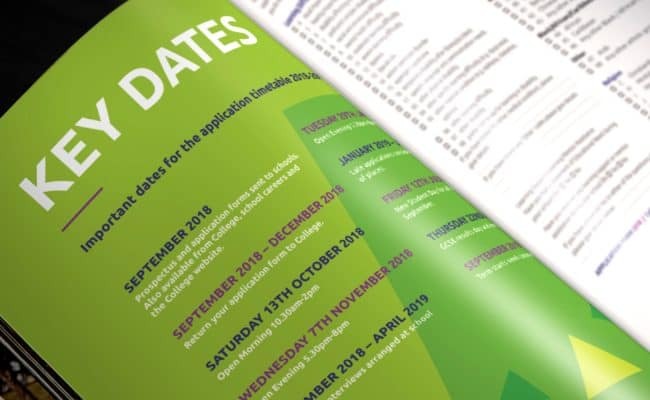 Highlight application deadlines and interview dates. Refer to UCAS (ucas.com). The universities and colleges admission service offers detailed information on how to apply and advises on finance. Discuss university partnerships (if any). Encourage people to check out open events. 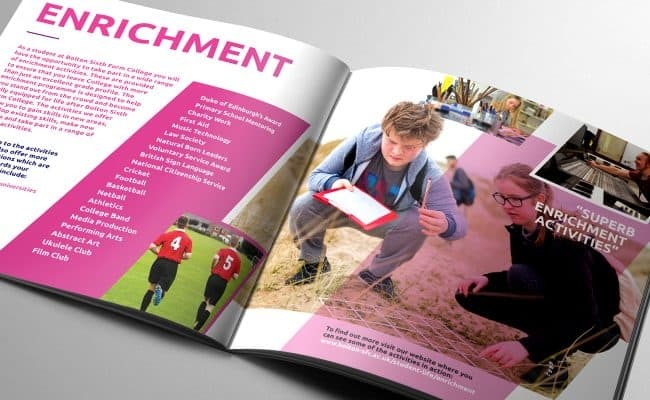 Go extra on the details to make your prospectus stand out (see below). Take time to proofread (spellcheck, grammar, links, deadlines, dates) the prospectus before sending it to print. Consider size options: A4, A5, 210x210mm. Will it need to be posted or should it be sized to fit in display racks? Check page numbers/pagination. 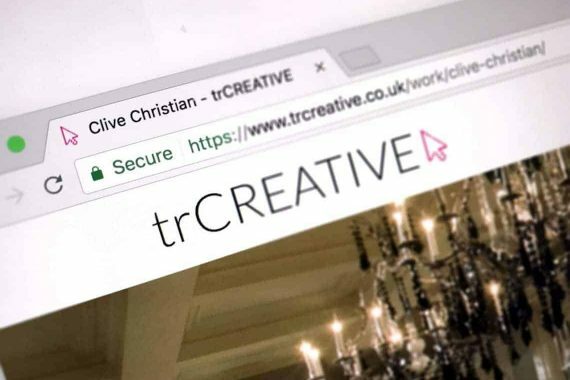 You can save costs by having fewer pages and more links to your website (for more information). 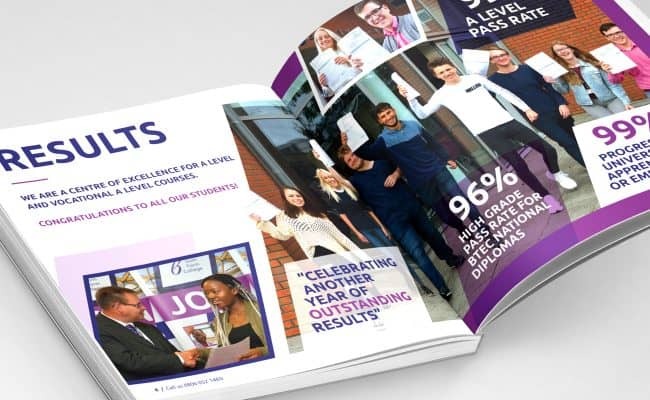 Make you prospectus stand out from the crowd with a striking print finish applied to the cover: spot varnish; metallic foil; embossing; die cuts. 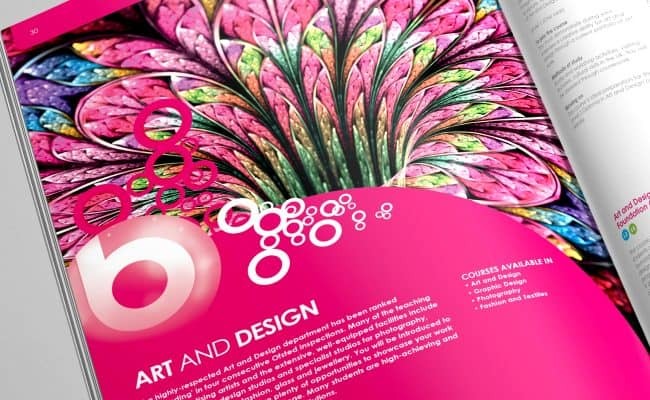 Choose a quality stock for inner pages with no show through. Print on FSC sustainable paper to show you are helping the environment. Encourage traffic to your website. 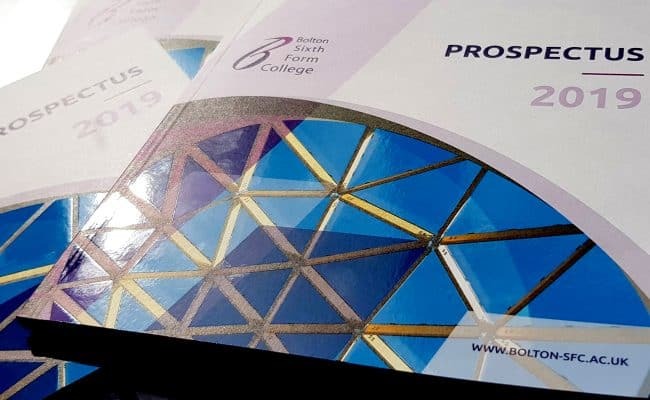 Direct potential students online to download further information: course information sheets (in-depth overview of individual courses); personalised prospectus (online tool that generates a personalised version of the prospectus including specific courses chosen by the student). Eliminate confusion, build trust. 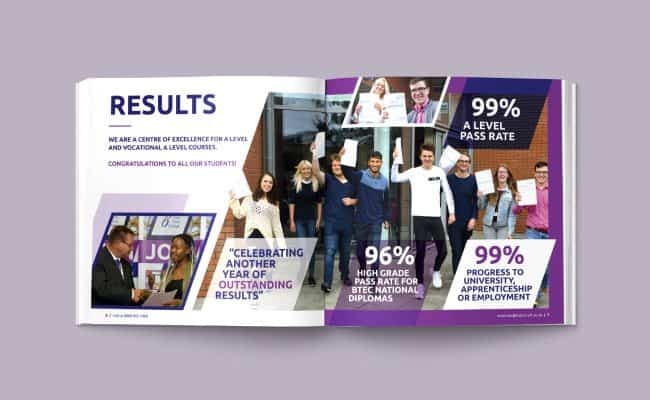 Design consistency across all marketing material (see below) strengthens brand identity, which is key to raising the profile of a college and communicating its core message. 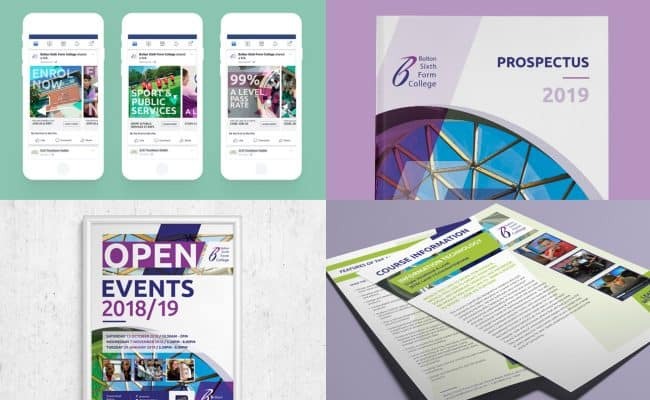 A clean, concise and consistent design looks professional and stands out from the competition, which in turn attracts students and boosts recruitment.